Once you touch down at Los Angeles International airport rides in sunny Los Angeles, California you can make your way easily out to one of the many limo pick up and shuttle drop off lax airport areas located just outside each of the terminals. Known as the congestion capital of the world, the frustrating part of traffic & waiting is practically synonymous with Los Angeles, but it doesn’t have to be the same at LAX. With a variety of interesting shops, restaurants, and amenities available, Los Angeles airports makes waiting not only tolerable, but a pleasure. You can find limo transfers from LAX airport throughout the day. But if you are staying on your trip longer than LAX has a large variety of parking lots that perfectly keep up with the non-stop flow. All the parking lots are located along World Way, which circles LAX in a roundabout fashion. Most lots are appropriately named after the closest terminal, so following that logic Parking 1 is adjacent to Terminal 1. 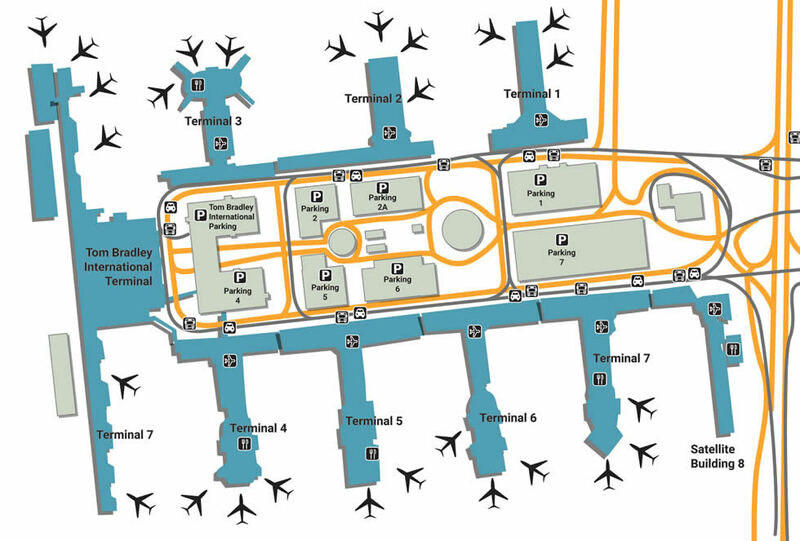 Parking lot 7 is big enough to touch both Terminals 7 & 8, while Parking Lot 4 does the same for Terminals 3 & 4. For easy access to Terminals 5 & 6, head to Parking Lot 6. Stay updated by visiting the LAX Live Available Parking widget, a part of the LAX site that updates on the capacity for each lot every 5 minutes. Many airports treat their guests differently, but with high-amenity services available at LAX, you’ll feel like you’re in first class especially with their Los Angeles airport transportation service. Utilize the free Wi-Fi, available throughout the airport, for hours of entertainment, browsing movies, articles, and other important work. There are also special services for military members at the USO Center, a safe haven for military-arrivals as well as their family, located between Terminals 1 and 2. There are also private nursing rooms located at every terminal as well as an on-site art program that humanizes a traditionally robotic experience. Treat yourself or someone you love by making an interesting purchase in one of the many retail stores at LAX. Visit the Access Hollywood shop (Terminal 6, Arrival Level) for just about anything you may need, from tasty snacks to beautiful flowers, or visit the ultra chic Emporio Armani, located at TIBET's Great Hall. With so many movie stars roaming about, the art of entertainment can’t help but enter passengers minds, which is exactly why In Motion Entertainment (Terminal 2) has become one of the most popular stores at LAX. Whether you’re from Los Angeles or a visitor looking at a new culture, you’ll know instantly that fresh food is serious business. Enjoy the beautifully displayed produce at Farmers Market To Go, located at Terminal 5’s Departure Level Food Court. For something just as fresh, but sweeter, head to La Brea Bakery at Terminal 1 Food Court, or grab a trendy drink at Nekter Juice Bar, a self-serve shop in the same location. If you’re a nervous flier that needs a drink before you board, grab a cocktail at the century-old Cole’s Bar, located inside of Terminal 4’s Food Court.